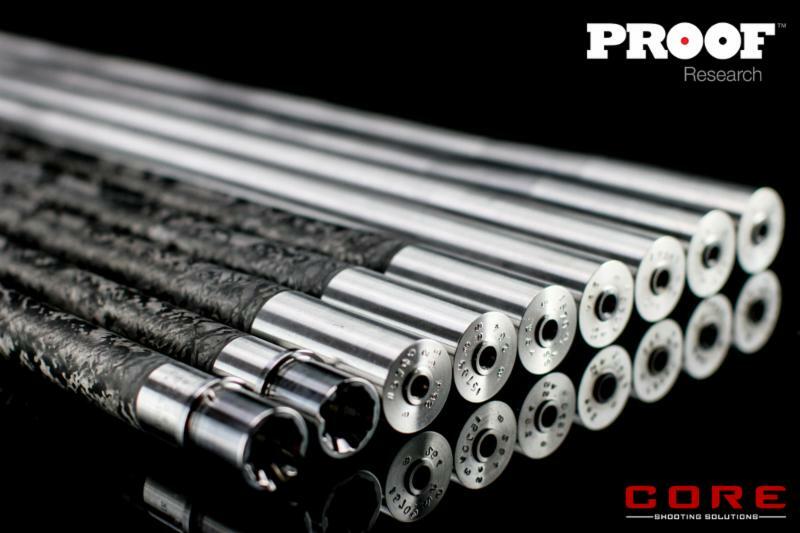 Baker, FL – CORE Shooting Solutions-one of the finest and most family friendly shooting/training facilities in the US, and a knowledgeable full-service firearms and firearms accessories retailer-is now an authorized dealer for high-quality PROOF Research carbon-fiber-wrapped barrels. PROOF Research, a science-based company located in Northwest Montana, is world renowned for designing and manufacturing precision carbon-fiber barrels that are a lighter alternative to traditional steel barrels while providing superior performance, extreme accuracy, and unprecedented barrel longevity. This “personal relationship” with PROOF is a result of PROOF Marketing Manager Chris Polley attending a training course at CORE’s facilities and experiencing the CORE difference firsthand. Polley, who’s been to his fair share of training courses, was duly impressed. “The advantage with CORE is that you are training in a world-class facility-with targets out to 1,000 yards, movers, and even cars-from highly trained, qualified instructors who are also well-respected top competitors with a knack for clear, concise, ego-free training,” Polley said of his training experience. CORE’s cadre of top-tier instructors includes world-ranked competitive shooters, Special Operations Veterans, long-range shooting specialists, and even a rifle-builder/big-game hunter that provides unrivaled levels of real-world experience and expertise in the competitive and tactical worlds to its students. These world-class instructors, along with a broad range of course offerings and a deluxe facility that’s continually expanding its range options and layouts, have made CORE Shooting Solutions one of the premier training locations in the United States. In addition to its training courses, CORE also offers shooting-range memberships; thehighest-quality firearms, parts, and accessories-now including PROOF barrels-sold through its full-service onsite pro shop and online website; and even hosts first-class national and regional shooting competitions for precision rifle, multi-gun, and various pistol disciplines for shooters of all levels, including the Accuracy International Long Range Classic, held at the company’s Baker facilities every spring. To learn more about CORE Shooting Solutions, the courses and products it offers, course schedules, instructor bios, or anything else, visit www.coreshooting.com, call 850-537-2718, or email info@coreshooting.com. This entry was posted in Uncategorized and tagged barrels, carbon fiber, CORE Shooting Solutions, PROOF Research. Bookmark the permalink.